A lucky ticket sold at the Agency Street Hy-Vee Store in Burlington will be making someone $2 million dollars richer. 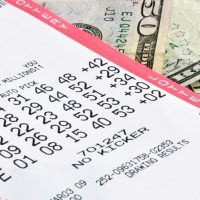 Iowa Lottery officials say the ticket matched the first five numbers but missed the Powerball, the Power Play option then doubled the winnings. Nobody has come forward as the winner yet, the prize will have to be claimed at the Iowa Lottery headquarters in Clive. Generally a lotto winner has up to one-year to claim a jackpot prize. Hy-Vee will also receive $2K for selling the winning ticket. It’s the second major lotto prize to be won in the state in recent months, a Quad Cities man claimed a one-million dollar Mega Millions prize earlier this month. Another million-dollar winning ticket remains unclaimed in Central Iowa.